Confession, opinion, and adventures from the fringe. Either that, or just random tomfoolery. Like a lot of people, I’ve been following the news of the devastation caused by Hurricane Harvey. Unlike a lot of people, I’m not praying. Prayer doesn’t put a family in a home, clothe the needy, or feed a child. 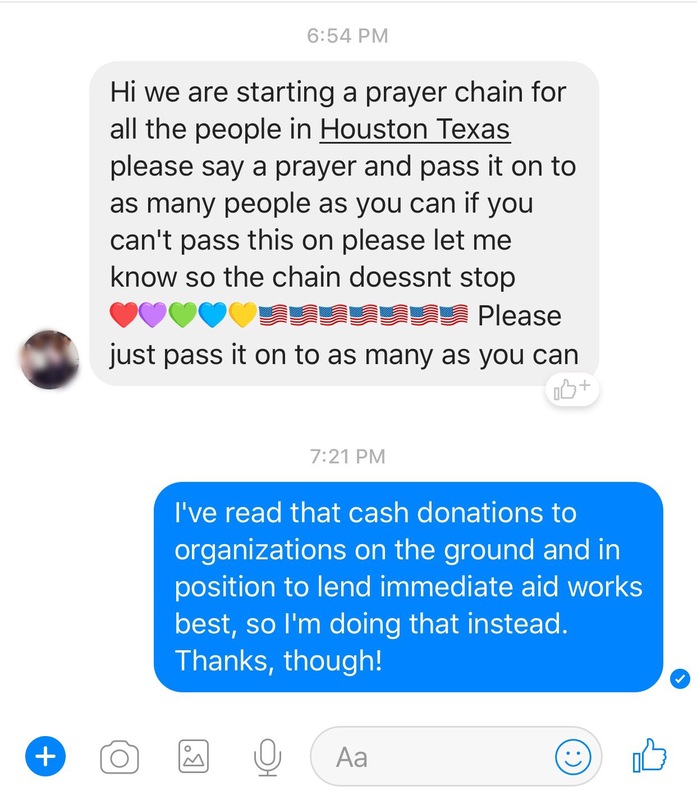 So when someone sent this “prayer chain” request on Facebook today, I responded respectfully, but honestly. I’ve visited the websites of a lot of popular charities. Americares, American Red Cross, Save the Children, etc. I’ve noticed they ask for a lot of things. Money, food, blood, clothing, and more. What you never see (or at least I’ve never seen) is a button saying “click here to send prayers.” Why? Because it’s useless. Prayers didn’t stop the storm, and it’s not going to clean up the mess. Now, I know this person, and they are among the kindest, most gentle people I’ve ever met. So it was a little embarrassing having to respond to such a thing. They had simply forgotten I was a non-believer, and later apologized. I told them not to worry, and thanked them for thinking of me just the same. But I do want to say that, in times of tragedy like what we are seeing in Houston and surrounding areas, what is needed is not prayers, but money, manpower, and supplies. If you live in the Houston area, you can personally reach out to local organizations. If you live across the country like I do, the best thing you can do is send cash to the groups on the ground. Confidential Korbus by Jason Korbus is licensed under a Creative Commons Attribution-NonCommercial-NoDerivatives 4.0 International License. 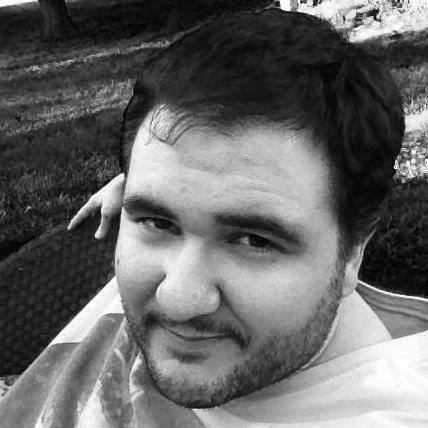 Jason Korbus is a friend, family member, possible werewolf, and co-host of Strange Frequencies Radio. Oh, and also one helluva cool guy! When he is not doing busywork, he can generally be found with his nose in a book, his eyes glued to a glowing screen, or his ears tuned to The Ramones. How do I know all this? Because I am him. Email me at: ConfidentialKorbus@gmail.com or find me on Twitter and Facebook.